In case you missed the notice at the end of Bryan’s post, B&H now has the new Canon EF 85mm f/1.4L IS USM Lens (review) in stock. Getting a lens for the ones you love makes a lot of sense at the time of the year just past (Christmas just passed in case you are reading this later) or any time of the year, really. But, getting a lens because of the ones you love is another great idea. I have never heard anyone say that they had too many pictures of their kids. If your kids are still at home, photograph them like crazy. Time flies – they will not be with you for long. If your kids are coming home, be ready to do the same. Visiting with your parents? Getting together with friends and other family members? The same advice applies. The chances are that even those who claim to hate having their picture taken will be glad you pressured them into it. Few lenses are as well-suited for photographing people as the Canon EF 85mm f/1.4L IS USM Lens, especially because the 85mm focal length provides an ideal perspective at normal portrait working distances. The image stabilization feature in this lens makes it even more capable in that role, especially when the light goes dim. Your skills aided by this lens are sure to make even the most difficult subjects look their best, including under very challenging lighting. Performing well the first time usually means the second time is more likely to happen. That photographing people is one of the easiest paid photography jobs to find is certainly an attraction for this lens. Portraits of specific individuals cannot be found in stock libraries and, in the marketplace, unavailability adds value. Of course, earning money helps to justify the purchase in the first place. Get this lens for your family and friends, for capturing treasured memories of them. 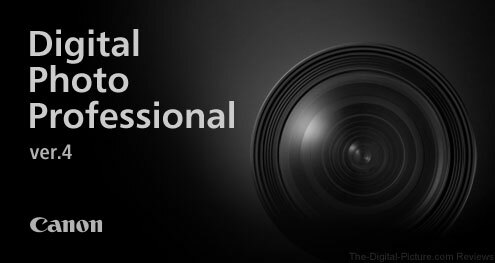 Get this lens for gaining clients and for keeping them happy. Get the Canon EF 85mm f/1.4L IS Lens for you. While I expect that you would love the 85 f/1.4L IS, even if you don't get this lens, I still strongly encourage you to photograph those you love with the lens you have. That you will not regret. The Canon EF 85mm f/1.4L IS USM Lens has been hard to find in stock since it first hit the streets, but it has just arrived in stock at B&H, Amazon and the Canon Store. It is coming soon to Adorama and WEX. Not convinced that this lens is for you? Or, want to spend only a short time enjoying it? Schedule some quality time via Lensrentals.com. According to the South Korean Yonhap News Agency, Reuters photographers have been banned from covering the opening ceremony of the 2018 Winter Olympics after they published several unauthorized photos of the rehearsal. The London-based media company transmitted several photo items showing the Olympic cauldron being lit up with fire during a rehearsal conducted late Sunday at the Olympic Main Stadium in PyeongChang. The company later pulled the items following protests from the International Olympic Committee (IOC) and the PyeongChang organizing committee. As penalty, the IOC "disapproved the issuing of passes towards Reuters in reporting and photographing the opening ceremony," the organizing committee of the PyeongChang Winter Olympics said in a statement. The IOC also revoked the media accreditation of the photographer representing Reuters. Read he entire article on the Yonhap News Agency website. Canon has released their finanicial results for the Full Year 2017. See below for more information. As usual, we suggest checking out the Presentation Material for getting a concise view of the highlights. 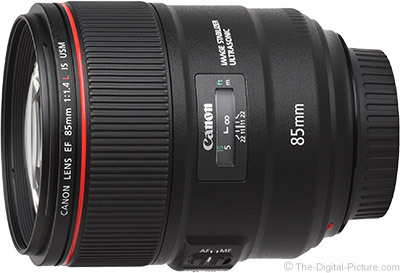 Amazon has the Canon EF 85mm f/1.4L IS USM Lens (review) in stock. This lens has been in very short supply since its release and Amazon says it only has (5) lenses available for purchase. 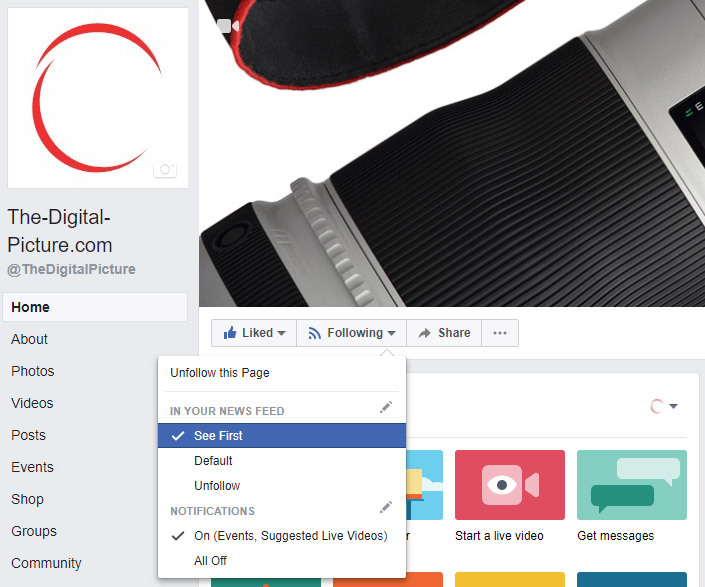 Important: Make Sure You "See First"
Facebook is making some changes and if you want to continue seeing TDP's posts in your Facebook news feed, it is important that you select the "See First" option under the "Following" button as shown. So, head over to the Facebook page right now and select that option before you forget! Permalink: Important: Make Sure You "See First"
For those of you who purchased a Solar ND filter to photograph the total solar eclipse we enjoyed in August of last year, you may be looking for more opportunities to use the highly specialized gear before the next total solar eclipse graces North America in April 2024. Thankfully, there's a large articificial satellite orbiting overhead which begs to be photographed as it crosses paths with the sun. Of course, I'm talking about the International Space Station (ISS), a 239 x 356 x 66 ft (72.8 x 108.5 x 20 m) platform in low Earth orbit that circles the earth about 15.5 times per day. The frequency of the ISS's orbits means that there's a decent chance that its path will fall between you and the sun in the not-so-distant future. When exactly will the next ISS transit occur in your area? There's a website designed to answer that very question. Simply enter your coordinates on the ISS TRANSIT FINDER website (or give it permission to auto-detect your location), enter a start date and an end date (up to 30 days in the future), and a travel range from your location (up to 149 mi / 240 km), and the website will show you the dates and times of all solar (and lunar) ISS transits available for viewing from nearby locations. If you never purchased a solar filter, you can still take advantage of the lunar transits occurring in your area or you can simply pick up a solar ND filter to take advantage of all available transits. WARNING: Use only ND filters certified for solar photography. Do not look directly at the sun. Do not frame the sun using your camera's optical viewfinder while using telephoto lenses. Use Live View for framing your composition and focusing. Most of the tips shared for capturing the solar eclipse apply to photographing an ISS solar transit, with the main difference being the duration of the events. When positioned in the middle of a total solar eclipse, the entire event may take several hours (with totality ranging from seconds to 7.5 minutes). However, an ISS transit of the sun or moon will last no longer than about 1.75 seconds (with typical transit times being significantly shorter). That means that you'll want to have an accurate clock available (down to the seconds), with a wired (or radio remote) trigger in your hand and your camera set to high speed continuous burst mode. 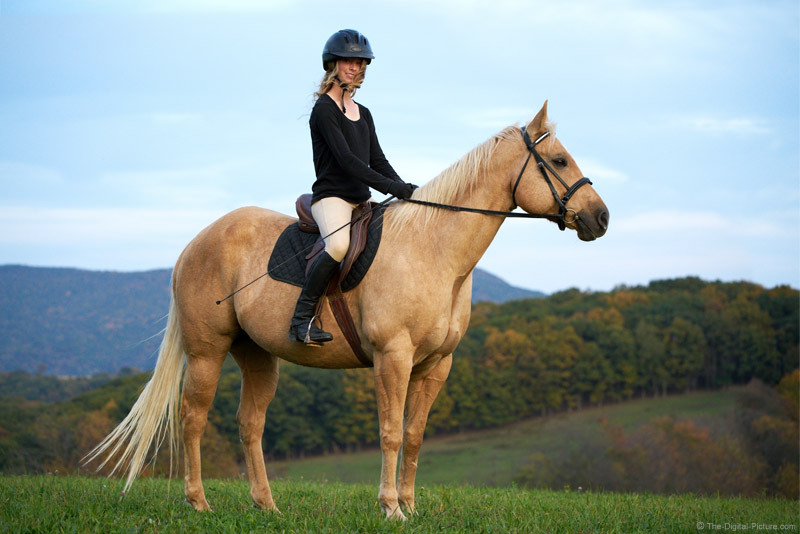 Mikayla wanted to go riding and I wanted to give the Sony FE 100-400mm f/4.5-5.6 GM OSS Lens a workout. Those "wants" fit together perfectly. For this session, we headed to the top of a nearby small mountain. With an unobstructed view and a low camera position, a very attractive, non-distracting background often becomes available in these "top" locations and that enables the primary subject to become prominent in the frame. The sky usually makes a good background and distant landscape also works well in that regard. The 100-400mm focal length range is a great one for chasing the kids with. In this case, when the horse was standing as seen here, I could move in close and zoom out to make the horse and rider appear large in their environment. When the horse was moving at a fast speed, I could zoom in to catch more-distant (safer) action and zoom out as the pair approached. 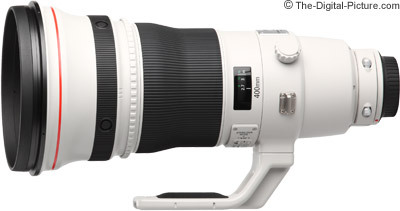 The FE 100-400mm f/4.5-5.6 GM OSS Lens is a great and much-needed part of Sony's lineup. Those with Sony-based kits should seriously consider acquiring this high-grade option (if it is not already there). This lens has the perfect combination of excellent performance and extreme usefulness. The Nikon MB-D18 Multi Power Battery Pack for D850 is in stock at Adorama with free expedited shipping. While casually looking through the Play store yesterday, Google suggested I take a look at an app called ASCII Art. As Google seems to know me fairly well (we've spent a lot of time together), I thought I'd give the app a shot. After about 20 minutes of throwing various images at the app to see its results displayed in glorious monospaced text, the point about Google knowing me very well was reiterated once again. ASCII – Abbreviated from American Standard Code for Information Interchange, is a character encoding standard for electronic communication. ASCII codes represent text in computers, telecommunications equipment, and other devices. Most modern character-encoding schemes are based on ASCII, although they support many additional characters. From the viewpoint of a photographer who's always looking at high resolution, 14-bit, as-sharp-as-I-can-get images, there's something very fun and novel about seeing one's images displayed in a fixed size font. You can even choose to have your image converted using colored text for a slightly less archaic look. After conversion, the file can be saved or shared as a .PNG, .TXT or HTML document (you'll need to change the file name extension from ".txt" to ".html" after saving). 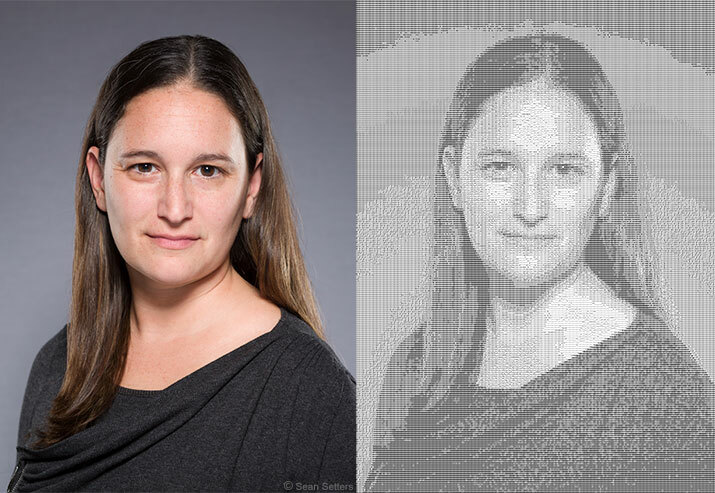 Click here to see the full resolution ASCII image from above. I haven't done extensive testing, but my guess is that simpler images with a strong subject will work better than more complex ones. 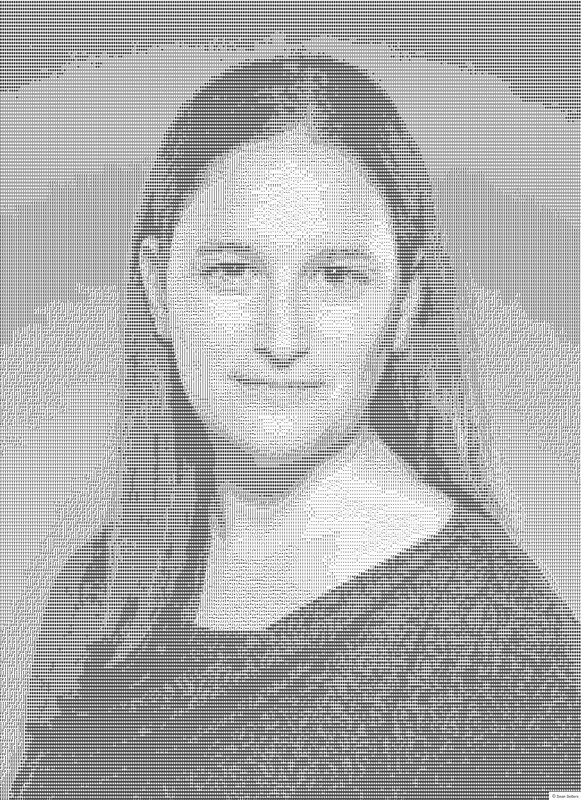 If you download and try out the app, share your favorite ASCII-converted (G-rated) image below. I've lowered the prices of most items in the fundraising sale. This is your last chance – I'll be moving this gear on to other outlets soon. Learn about fluorite, aspherical ED and phase fresnel lens elements along with nano crystal/fluorine coatings, vibration reduction and more.